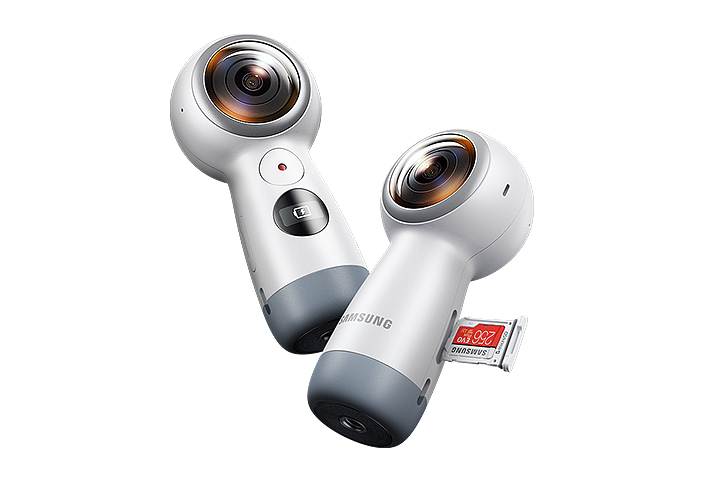 Samsung’s Gear 360 places the keys to creating immersive, 360-degree content in users’ hands, offering a new and engaging means to capture their most memorable moments. The camera’s latest edition is equipped with new features and a refined design to make sharing those moments even easier, adding further depth to viewers’ immersion with impeccable 4K video. Likewise, the new Gear VR with Controller allows for enhanced virtual reality experiences and easier interaction. Let’s take a closer look at these new additions to Samsung’s expanding VR ecosystem, designed to make immersive 360-degree content more accessible and enjoyable. The Gear 360 lets users record 360-degree videos that place viewers at the heart of the action, capturing a complete picture of the recorded experience as well as all the emotion, excitement and beauty that made it memorable. Such vivid detail is possible thanks to the Gear 360’s best-in-class cameras, which feature dual 8.4-megapixel fisheye lenses that support 15-megapixel images and, for the first time, immersive 360-degree 4K videos. The bright F2.2 lenses provide crisp detail even in low-light conditions, allowing users to create high-resolution content regardless of the time of day. To help creators put their best content forward, the new Gear 360 comes equipped with a variety of shooting modes and editing tools, and makes it possible to effortlessly convert 360-degree videos into standard formats for easy-to-share content. The camera also supports high-quality, 360-degree live broadcasting*. When synced with a compatible smartphone or computer** via Wi-Fi or a USB cable, the device enables users to easily upload content to stay connected no matter where they are. They can also seamlessly livestream their content on platforms such as Facebook, YouTube and Samsung VR. The Gear 360’s updates also extend to its design, which retains the familiar black and white, astronaut helmet-inspired aesthetic but in a compact and lightweight form for enhanced portability. Furthermore, the integrated tripod provides a comfy, one-handed grip, and is compatible with a selection of third-party accessories and mounts. The Gear 360 will be available in select markets in late April. Featuring a refined design and a new, multifunctional Controller, Samsung’s latest Gear VR**, powered by Oculus, introduces more comfort and fun to the virtual reality experience, taking users’ immersion to entirely new levels. Built to combine the functions of a gamepad and remote control, the standalone, motion-sensitive Controller adds comfort to the Gear VR experience by placing the device’s controls in the user’s hands rather than on the headset itself. With a curved design, the Controller offers a natural grip for enhanced one-handed control. Its clickable touchpad and trigger allow users to easily navigate VR apps and virtual worlds with simple motions. Meanwhile, the intuitive layout of home, volume and back keys ensures easy access to the functions, so users can manage them while fully focusing on their activity. In addition, the Controller offers better motion interaction with minimized arm and head movement for comfortable and prolonged use. And for those especially active moments, the wrist strap provides a secure grip. When finished with a VR session, the Controller may be conveniently holstered on the headset’s strap. The Gear VR headset’s ergonomic design makes for a secure and highly wearable fit while its expansive field of view (101 FOV) helps to minimize users’ motion sickness so they can enjoy immersive visuals for longer periods of time. Furthermore, Gear VR users will never get bored as there are hundreds of diverse apps to choose from in addition to a newly added social VR party service that allows them to connect with friends to chat, watch videos and livestream games on social media. Offered for the first time in an Orchid Gray finish, the Gear VR will be available for purchase in select markets in late April. * The Nougat OS is required for live broadcasting functionality. ** The latest edition of the Gear 360 is compatible with Samsung flagship devices including the Galaxy S8 and S8+; Galaxy S7 and S7 edge; Galaxy Note5; Galaxy S6, S6 edge and S6 edge+; Galaxy A5 (2017); and Galaxy A7 (2017). Gear 360 offers greater compatibility with devices running iOS 10.0 or later including the iPhone 7, iPhone 7 Plus, iPhone 6s, iPhone 6s Plus and iPhone SE, as well as Windows/Mac computers. *** The new Gear VR with Controller is compatible with the Galaxy S8 and S8+; Galaxy S7 and S7 edge; Galaxy Note5; and Galaxy S6, S6 edge and S6 edge+. In addition, the Controller can be purchased separately and connected via Bluetooth to compatible Samsung smartphones to work with previous versions of the Gear VR.